Yesterday I was working on a silly needle-felting project (that shall remain secret for now) and I needed a small amount of yarn for a knitted accessory. I found myself eyeing a small basket full of handspun skeins of yarn that I have out on display. These skeins were created during my Spinning Obsession of 1998- 99. I took classes, I bought a spinning wheel, and I devoured back issues of Spin-Off (generously loaned by a neighbor who was an enabler weaver). Then my husband and I moved to a new city, bought a fixer-upper, and had a baby, and the spinning wheel was relegated to the junk guest room until I could find some free time. During that obsessive period I was so focussed on spinning yarn that I never knit with any of it, not even to make swatches. It just seemed too precious to actually use. But last night I grabbed a skein and wound it into a ball, then cast on a few stitches. 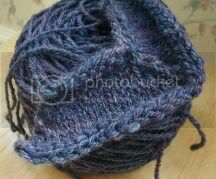 Here you see about 160 yards of handspun merino, navajo-plied, probably a light worsted weight. The fiber is an Ashland Bay multicolor blend that I got from Paradise Fibers as part of a package deal when I bought my spinning wheel (see below). It knit up much more evenly than I thought it would. * It is soft and springy and generally just gorgeous. How could I have let this sit in a sad little skein, all alone, for so long? And--more importantly--how can I get more? 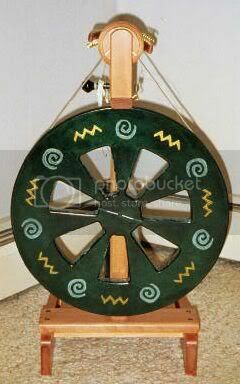 The answer, of course, is to get my cute little Ashford Kiwi out of storage and get her spinning once again. I have been thinking about doing this for a while now, and one of my goals for this spring is to tighten up her screws, get her a new drive band, and move her to the living room...just in time to go the MA Sheep and Wool Festival and buy lots of colorful roving. I have two more pounds (yes, pounds!) of the multicolor merino top. So hopefully there will be lots more yummy yarn in my future. *Anyone have a guess as to what I am knitting?